The Year of the Ox (starting January 26th on the Gregorian calendar) is bringing us good fortune. Renaissance woman Grace Lin (Year of the Dog / Little Brown) is going to be auctioning off a painting a month to benefit The Foundation of Children's Books' program of bringing authors into low-income schools. The first auction starts on Monday, Jan. 12th. 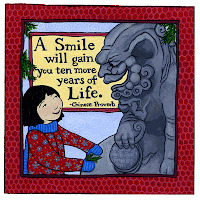 (Proverb: "A smile will gain you ten more years of life." So true.) You may find out how to bid here, and please spread the word.